Access recovery mode on iOS devices. 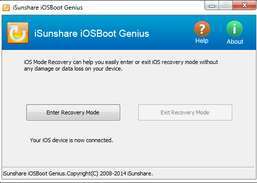 iOSBoot Genius is a powerful tool controlling iOS device recovery mode access with one click, and without data loss or damage. 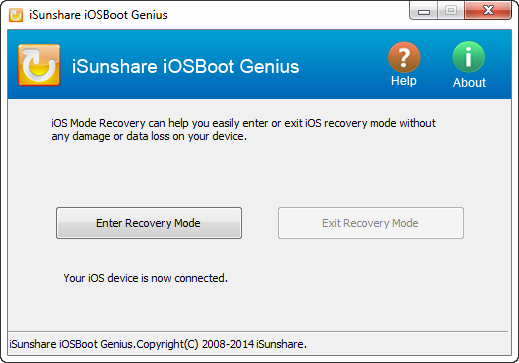 With iOSBoot Genius in hand, you can get in or out of recovery mode as you like. And you can solve idevies boot issues by entering or exiting iOS recovery mode. Recover contacts, messages, photos from iPhone 6 and iPhone 6 Plus. Retrieve data from your iDevices, iTunes backup and iCloud backup. 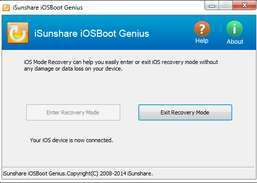 Recover iOS device from iTunes backup, iCloud backup, or directly from the device. Recover and extract lost WhatsApp messages for iOS devices. Recover lost or deleted data from iOS devices.